Ah, London. Ah, the V&A Museum…. As you might have gathered from looking reading some recent posts or if you follow me on Instagram, I have recently been in London on a whirlwind, 72 hour long weekend. It was non-stop fun and one of the best parts just might have been this exhibit. 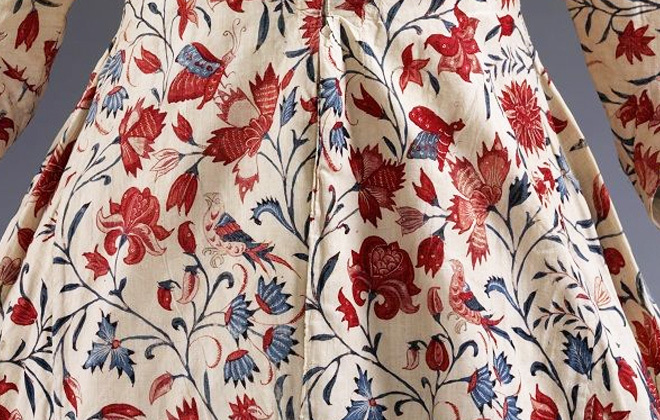 I was absolutely beside myself with excitement to go see the Fabric of India exhibition at the V&A Museum in London, and the rich, fabulous display of fabrics from all over India – a millennia of history – certainly did not disappoint! I arrived at the exhibit raring to go, with my fully-charged, super camera (my beloved Sony) and was crushed to learn that I would not be allowed to take pictures. Crushed! But in the end, it may have been a good thing because I would have been there all day and night trying to capture every mouthwatering detail. Thankfully, there were enough pictures online provided by the V&A that can begin to depict the splendor. And I made sure to just really look at the exhibit and take it all in. The amazing entrance to the exhibit where I was told to put away my camera by a big, ugly, sign! Thus, this picture and all that follow are from the Victoria & Albert Museum. 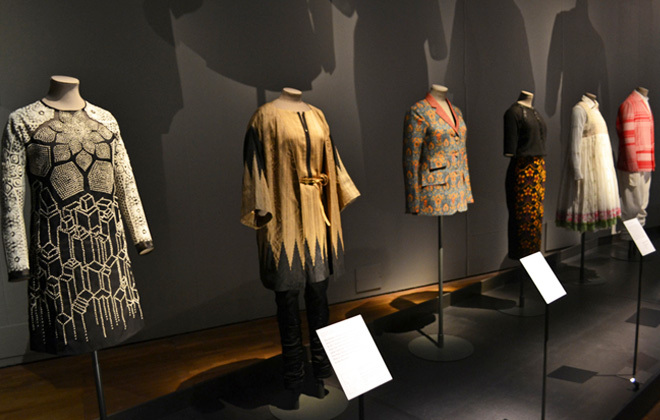 The exhibition showcases the diverse and vast history of both decorative and functional Indian textiles, with pieces ranging from 3rd century fragments, to contemporary designers such as Sabyasachi Mukherjee ,who has become one of India’s most successful designers by bringing together traditional themes with a contemporary flare. I was just blown away at the intricate, colorful, and minute details, all of which are done completely by hand! An amazing, full built up tent. Gorgeous to stand in and look up. A wide variety of over 200 handmade examples are on display, from everyday pieces to ceremonial banners, creating a visual compendium of India’s diverse array of fabrics. 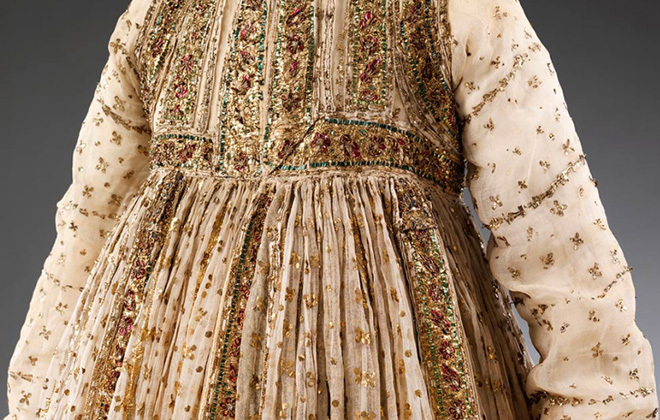 Traditional techniques of wood-blocking, weaving and embroidery are showcased through elaborate wall hangings and couture wedding costumes. 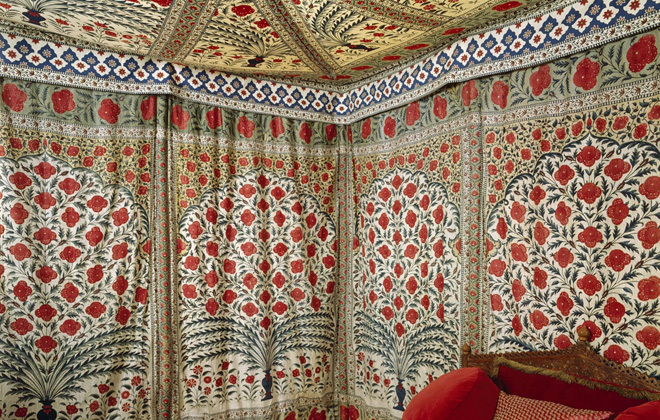 The exhibit also fascinatingly weaves (pun intended) the viewer through the intense history of fabric in India and the seriously important role it has played. Gorgeous pattern and colors. Looks current even though its over 100 years old. 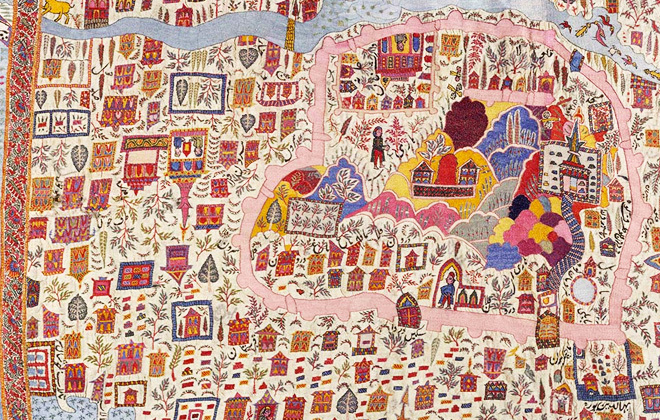 This is a map that was also a shawl that was all covered in woolen embroidery. It’s from Kashmir, 19th century. Stunning muslin border embroidered with beetle wings from the 19th century. 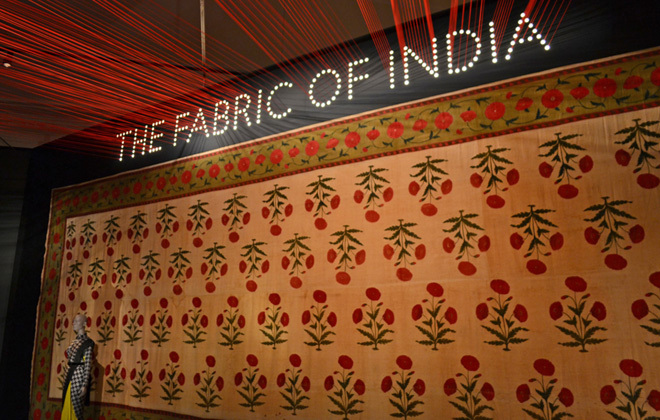 Some examples at the end of the exhibit depicting modern day designs of India. 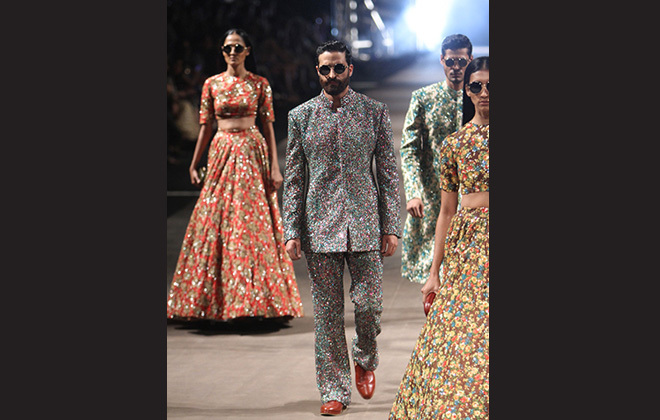 This show is a must see for anyone who is as in love with rich and layered patterns and colors as I am! 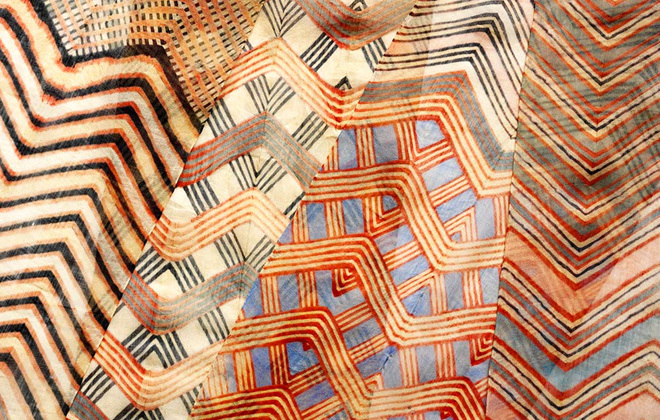 So much inspiration here, along with the fascinating and informative history of how this immense culture has set the stage for innovation in textiles across the world, and continues to do so today. In this age of mass-market consumerism, I am constantly on the hunt for the highest quality handmade goods. 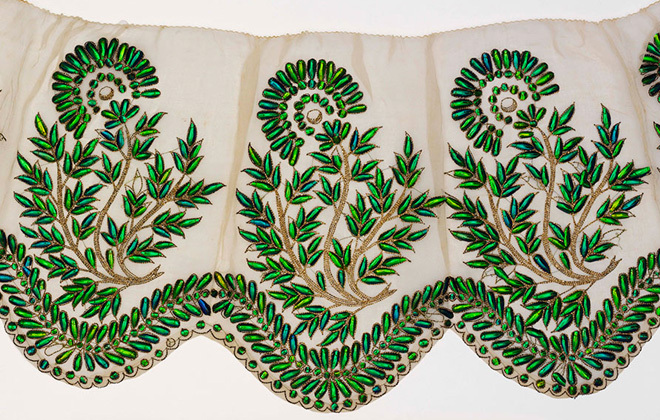 Much of the worlds block printed and embroidered textiles are still predominantly being produced in India, by hand, even in the wake of the industrialization of the fashion and textile worlds. It is so important that these traditions remain in practice, and that they are done so ethically. This is why I am now on a mission to find designers and craftspeople around the world that are utilizing the Indian Textile industry in the best ways possible. I look forward to sharing with you my findings!